Imagine it’s 8 p.m on a Saturday night, you have to hit a party and when you look the mirror, you just find out you’re having a bad hair day. We all have been through this nightmare at some point in our lives. Thanks to the advent of new technology, you don’t have to pray to God for mercy to visit a salon to get your hair styled just the way you dream. You can do that at the comfort of your home if you have a good flat iron handy. Now there are a lot of factors that constitute a good flat iron. More on that later. For now, the basics you need to remember is that the best flat irons are made from premium quality plate materials like titanium, tourmaline or ceramic. Two, they use less heat to avoid frying your precious tresses. Now we know it can be a daunting task to find the right hair straightener in a market loaded with options. That’s why we have done the hard part for you. We have down the options to 10 models, hoping you’d find a product that suits your needs from our list. There are tons of varieties of flat irons to choose from. Once you begin your search, I bet you’ll be left spoilt for choices. To make the decision a tad easier for you, I have divided my reviews into two sections- one dedicated to thin and straight-haired women like me and the other to curly-haired beauties out there. Because these two different hair types demand different kinds of love and care. The specifications such as plate size and temperature range vary widely depending on the hair type and length we are dealing with. What to Look for When Choosing Flat Irons for Straight Hair? What to Look for when Choosing Flat Irons of Curly and Wavy Hair? Let us now look at our review for the ten best affordable flat irons in more detail. One of the biggest advantages of HAI GOLD is that it is suitable for almost all types of hair- be it straight and shiny, naturally curly or color treated hair. This makes it a viable option for both professional hairstylists and women who want to style their hair at home. 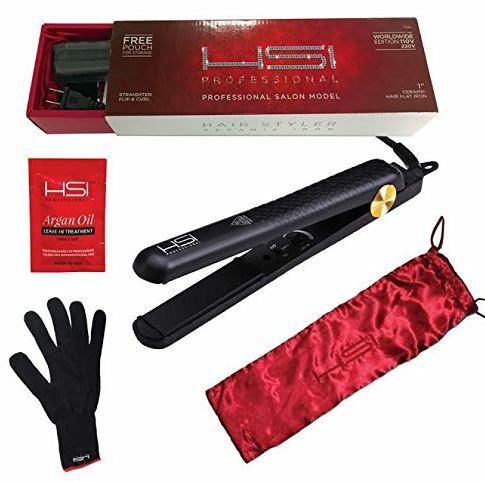 The hair straightener is a staple styling equipment for the famous hair stylist Anderrateliehair (Hair stylist-Ándërr Hair). That alone screams of the product’s credibility, doesn’t it? Tri-diamond ceramic gold plate for smooth, frizz-free, salon-like hair styling. Works on most types of hair. Produces negative ions to deeply nourish your hair. At the first glance and even upon taking the flat iron in hand, it looks and feels like a super luxurious, fancy professional-grade equipment. But in reality, straightener doesn’t cost an arm and a leg. Once you use it yourself, you might realize that it delivers much more than most of its competitors at same price-point. The material used in creating the hair straightener is a class of its own. Much of this product’s credibility should be attributed to the Tri-diamond ceramic gold plates with “diamond glitter” coating. The manufacturer has carefully selected this unique material to ensure that the iron slithers away easily along your tresses. If you use it correctly, it can leave your hair smooth, shiny, straight or create the exotic beach wave look right off the bat, thanks to the one-pass technology. And oh! Did I forget to mention that the ceramic gold plate allows for around, if not less, 120,000 passes? Unless you drop it from a great height or try to do some wild experiments with it, the device will last you for a pretty long time. Another incredible benefit of ceramic styling is that it treats your hair gently, leaving it damage-free, frizz-free, all this without spending a fortune at a fancy salon. But wait, the good things don’t come to end just here. To facilitate salon-like styling treatment, the HAI GOLD comes packed with customizable heat settings, ranging from 250F-450F. Right before you start straightening your strands, choose a heat setting depending on your hair type. If you are not sure which heat setting will suit your hair type the best, you have the entire world wide web at your service, madame! The makers have also made a perfect utilization of the cutting-edge Tourmaline technology which ensures no dryness, static or frizz can spoil your jawdropping hairdo. Not just that, the Ionic Mineral Complex simulate negative ions that deeply moisturizes your hair, giving it a voluminous, healthy appearance. About to use a flat iron for the first time? Feeling a bit nervous? Fret not, I’ve been there too. I won’t hesitate to recommend this model to newbie users as it is incredibly easy to use. The ergonomically sound design, non-stick ceramic plates will make the task easy for you. Although one or two strands of your hair may get stuck in the temperature dial at times, it isn’t too big an issue to be labeled as a dealbreaker. What further adds to the ease of use is its consistent heating. It doesn’t take the equipment long to reach your desired temperature. One tip for you before I wrap up the review. Lightly spray a heat protectant solution on the hair before you apply the heat in order to seal the cuticles and protect the tresses from heat damage. Not only straightens but also nourishes your hair to prevent frizz, static and dryness. Protects the scalp from heat damage. The brush results to less or no damage compared to traditional flat irons. The ceramic gold plate allows for approx. 120,000 passes. A few hair strands may get stuck in the temperature dial at times. Due to the same reason, needs to be cleaned often. HAI Gold flat iron is not without its fair share of cons. But if you are a little cautious while using the iron and clean it from time to time, I don’t see any reason why you should face any problem using it. Just a tad extra attention and you will get salon-like straightening results, sitting right in your room. That’s the goal, right? Getting frizz-free hair, that too without spending a fortune in a fancy salon. Sounds too good to be true? Let us take a moment to thank Jesus for introducing us to the Ceramic and Tourmaline technology. HeatBalance microsensors aid even distribution of heat. Suitable for fine long hair as well as coarse curly hair. Contains Tourmaline and Ceramic ion plates for a sleek and smooth finish. Comes with a 360-degree swivel cord. The package includes freebies like heat protection glove, argan oil treatment, and a styling guide. If you have a really fine and fragile hair like me, your hunt for the best flat iron is going to be daunting. I know, I’ve been there too. What makes this particular model perfect for this hair type is the precise heat control and uniform heat distribution it offers. The iron plates reach a high temperature in a flash and offer a wide temp range of 140 degrees F to 450 degrees F. So no matter what kind of hair we are dealing with here, long or short, fine or coarse, expect to get a silky smooth finish with minimal effort. I am not exaggerating when I say it leaves you with a fluffy, silky, bone straight hair with a voluminous appearance in just 5 minutes. The HSI Professional Glider has successfully managed to strike a balance between usability and performance. 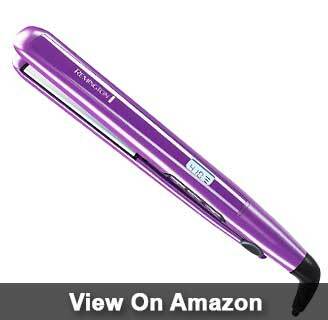 The iron is easy to grip and has 1-inch wide plates which make it suitable for all hair types. I absolutely loved the length of the cord. It is long enough not to get tangled. Plus, there’s a 360-degree swivel cord which allows you to straighten your hair at any angle you want. All these coupled with top-of-the-line professional capabilities. To find so many bells and whistles in a moderately priced product is no less than a miracle. HSI Glider doesn’t just straighten hair. It has 3-in-1 function rolled into one. You can also flip and curl your bangs, thus letting you create gorgeous beach waves in a snap. Doesn’t get more awesome, does it? Awesomeness doesn’t end just here. This straightener is a godsend for users who are using a searing hot flat iron for the first time. I noticed that the plastic bits behind the ion plates never get too hot. That way, you won’t burn your finger if you accidentally touch those parts. The product stays true to its name. The “Glider” plates glide along your tresses like softened butter on sourdough bread. No pulling or tugging unless you are using the iron like a sword. Although it reaches high temperature quickly, the heat remains steady for quite some time. It packs a couple of HeatBalance microsensors that aid a uniform distribution heat and prevent hotspots. However, unfortunately, the iron still gets a few hotspots when too hot. This means with each pass, a certain section of your hair will be perfectly straightened while certain bits won’t. But I am quite confident that with time and practice, you will be able to maneuver the iron more adroitly. Straightens, flips, and curls your tresses. Reaches high temperature really quick. Offers a wide range of temp adjustments. Heat-balance micro-sensors help with even distribution of heat. The plastic parts are safe to touch even when the plates are hot. Cannot be used on wet hair. HSI Glider packs a number of features I have struggled to find in products in its cost spectrum. No matter what your hair type or skill-set is, maneuvering this flat iron will be a cakewalk for you. As for the hotspot issue, you won’t be having this problem once you master the heat adjustments for your specific hair type. That shouldn’t take long. lori_theexclusivestylist (Hair Stylist) choose FURIDEN and says that hair straightening is now easier and faster with this iron. 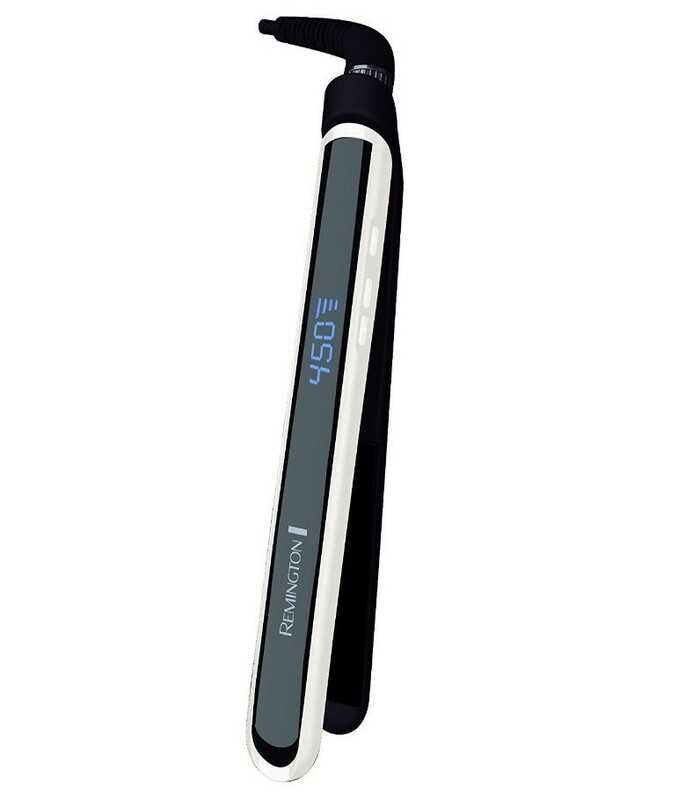 This hair straightener is innovative, and it incorporates advanced hair care technologies. It’s not easy to find a hair straightener that curls your hair with equal precision without blowing your budget. Having said that, I was lucky to chance upon FURIDEN 2 in 1 which combines the best of both worlds, that too at an affordable price! Styling your hair with professional-level precision has never been this easy. 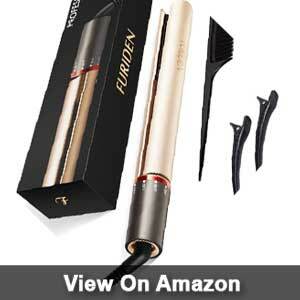 What makes FURIDEN a great combo flat iron is its shrewdly sculpted circular design. So be it super-tough to manage wavy hair or fine long hair, it can handle anything you throw at it. Adjustable temperature with an easy-to-turn knob. 360-degree swivel cord provides free motion. Provides a wide range of temperature settings. Comes with useful accessories like glove, comb, travel case etc. FURIDEN 2-in 1 straightener is a revelation. It is unique in many ways, be it is out-of-the-box design or functionality. I know many women who are reluctant to use flat irons fearing it will leave their hair dry and frizzy. This fear is legitimate. Most flat irons have hotspots and unsteady temperature which leaves your hair high and dry. But not FURIDEN. It uses steam to lock the moisture in your hair, helping you end up with defrizzed hair with light waves at the bottom. Now, can it be any more awesome? This is undoubtedly the most critical feature to take into account while choosing a flat iron, especially for fine and fragile hair. This model provides a temperature range of 250 to 450 degrees. Go with a temp between 250-350 for long and fine hair. Dial it up to 400-450 degrees for coarse, curly hair. I like how the bottom of the iron doubles up as a temperature adjuster, giving your hair a bouncy look, in case you don’t want a bone straight hair. Adjusting the heat is a breeze. There’s a one-step knob which you have to rotate clockwise to increase the temperature. Although the manufacturer says that the iron gets super hot under 15 seconds, mine took about 30 seconds at 320-degree settings. Not a con, just stating the fact. Add to this, there’s an LED light indicator which flashes when the iron is ready to use. The small but bright enough LED screen lets you monitor the operating temperature. The FURIDEN 2-in-1 operates at the voltage range of 100V-240V. So no matter where you are in the world, as long as you have electricity, this grooming tool will deliver. The plates are made of high-quality ceramic, ensuring that you can style your hair without experiencing any tugging or pulling. And it does deliver what it promises. To further enhance the ease of use, it comprises a 360-degree swivel cord that prevents tangling and allows a bucket load of flexibility. It also features an auto shut-off function. Basically, it switches the device of automatically after 60 minutes. However, you should never be so careless as to leave a piping hot iron switched on after use. Dual functionality- both straightens and curly hair. Dual voltage settings (100 V-240V). Highly portable due to its compact design. This hair straightener can get extremely hot. The ease of use and dual functionality at an incredible price make this product a deal worth grabbing. Although you won’t be able to get tight curls with it, it will help you produce tousled locks and that much sought-after beach wave under just 20 minutes. The 5 temperature settings make it suitable for all kinds of hair imaginable. Loriane J, the famous hair stylist from Chicago and owner God’s Hands Beauty Salon always keeps this flat iron in her styling kit. Now you know why. Taming long, wavy, frizz-prone hair takes a heck lot of time. Who does have all the time in the world when you got to leave for office in the morning in about an hour? For super busy women out there, this grooming tool could be as good as it gets. Instead of ceramic or tourmaline, it ups the game by including titanium plates. Titanium plates glide over the hair smoothly. Precise temperature adjustments with LED screen. The slim and compact design of the Babyliss Pro is the first thing that catches your fancy as soon as you take it out of the box. This Italian beauty is meant to go easy on both your hair and hand. It makes it a point not to fatigue your hand while you are busy styling your hair. The wide, cushioned plates eliminate the need of tightly clamping your hair. All you got to do is divide your hair into a few sections, pass it down your tresses for pin straight hair or wrap it around the barrel if you want curls. You will get tons of video on how to use this bad boy to get different types of looks such as loose curls, beach waves, bone straight strands, spirals and so on. You can also watch the tutorials of celebrity hairstylist Ruslan Nureev who never shies away from endorsing his undying love for this specific Babyliss model. The possibilities are virtually endless once you get the hang of this device. 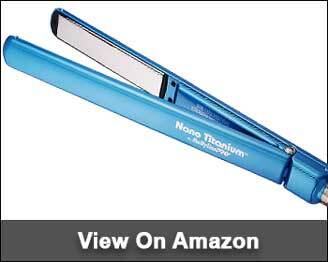 One of the best things with titanium plates is that even though it can get too hot at times, it doesn’t leave your hair dry. Instead, it might take you less than 5 minutes and a single pass to style fine bleached hair. The titanium, extra wide plates not only gets hot fast but also holds the heat steadily for a long span of time. I absolutely adore the consistent heating. I could barely find any hotspots while ironing my colleague’s hair. The plates are scratch-resistance so getting your tresses snagged should be least of your worries. Let me give you a quick brief on how the Babyliss pro is an exceptional energy and time-saver. The 5-inches extended wide plates can reach 450 degrees under a few minutes and work on a thick section of hair at once. High heat and fewer passes mean your hair will be party or office ready before your coffee gets cold. However, there’s a caveat. I would strictly recommend against pulling too much hair with each pass. It can lead to a pulling sensation. Also, on a slightly disappointing note, this otherwise brilliantly designed machine doesn’t have precise temp settings. The 50 heat settings imply temperature ranges, not the exact temperature. Bummer! I know. 5 inch wide plates can handle a big section of hair at a time. Reaches a temp up to 450 degrees in a blink. Helps you style and groom your hair any way you want to- be it creating spirals, beach waves or bone straight tresses. LED screen shows temperature range you’re operating at. Doesn’t offer precise temperature adjustments. Can get too hot if you are not attentive enough. Whether you are a working woman, somebody battling with frizz problem or simply looking for a salon-like hair styling tool for all hair types, Babyliss Pro Nano will exceed your expectations. It’s fast, it’s efficient and most of all, it manages to bring out a pro hair stylist in you. As far as the lack of precise temp control is concerned, a thorough reading of the user manual should easily fix the issue. Why thick hair and not fine? Because Remington 1” Flat Iron’s lowest temperature setting isn’t that low, after all. 310 degrees is the lowest you can get. If you are blessed with coarse, thick hair and need a flat iron for creating tight curls, this device is straight outta heaven for you. You will also love the fact that the plates come in two sizes- 1 inch and 1.75 inches. The 1-inch version should work just fine for medium-length coarse hair. But if you have longer hair, go for the wider plate model. The plates come in two sizes- 1 inch and 1.75 inches. Auto shut-off in an hour. Comprises of ceramic plates with titanium protection coating. Floating plates aid easy gliding and prevent hair snagging. There are a lot of good things going in for this super affordable grooming tool. Let’s begin with the floating plates. As advertised, these floating plates do eliminate the necessity for multiple passes on a single section of hair. This drastically reduces the styling time. Also, these floating plates get piping hot under 30 seconds and provide consistent heating, leaving no hotspots. So much at such a low price? Seems a bit fishy, right? Same pinch. So I dug a little deeper and found that the device houses only one floating plate. The rest of the plates are fixed. While that doesn’t affect the overall performance, it does pose a risk of your hair strands getting stuck between the plates at times. It is an absolute delight to know that it comes it two plate sizes. If you have long and fragile hair, you should definitely opt for the longer model. The 1-inch model works like a charm on coarse, thick, wavy hair. Thanks to the floating plate, you will never have to touch up the same section twice. I also liked the fact that the plate has rounded edges, allowing you to have loose curls at the bottom of your hair for that bouncy look. And I don’t know what’s the sorcery here but after ironing, your hair looks dramatically shiny and voluptuous. Not just that, it also features a swivel cord which spares you the trouble of twisting your hand while styling your hand. Curl or straighten at any angle without worrying about getting your hair painfully snagged. The digital read-out of this machine is the most accurate I have come across in this segment. For its price range, it is straight-up phenomenal. It will help you constantly monitor the temperature so that you don’t end up charring your beloved cuticles or frying up the strands. Add to that, there’s the much-coveted auto shut-off feature which will automatically turn off the device after 60 minutes. If you are a forgetful creature like me, you should never buy a hair straightener which lacks this feature. Best suited for coarse, thick hair. The plate comes in two different sizes. Can reach a temp up to 410 degrees under a minute. Floating plate speeds up the styling process. The lowest temp it can achieve is no less than 310 degrees, not suitable for sensitive hair type. Leaves a burning smell in your hair after straightening. The Remington 1” Flat Iron is not without shortcomings, but which product is? And considering the tiny price tag, I would say this device has set the bar really high, even for its costlier counterparts. However, 310 degrees is nowhere near low for heat sensitive hair. So if you have long, thin and fragile hair, perhaps you should look for a machine with lower temperature settings. The rose pink encasement of this Kipozi model is a real eye-candy. I bet one look at it and your gal pals will be definitely tempted to check out this product. But buying a flat iron, especially for coarse, curly hair goes much beyond just looks. Curly hair (especially, if it’s damaged) requires extra love, extra care, and KIPOZI flat iron effectively delivers to these specific needs. Hairstylist and educator Marissa Mae Neel says she can’t get enough of this utterly useful grooming device. 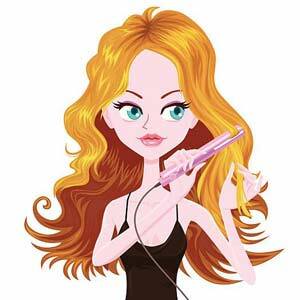 I’m quite sure you’ll feel the same way a week after using this magic styling wand. Its 1-inch wide titanium coated ceramic plates can reach a desired temperature in an incredibly short span, under 30 seconds to be more precise. Not only it heats fast but also retains high heat for a long time. This is particularly beneficial for curly, thick-haired women out there as you don’t need multiple passes to loosen curls or create spirals. The nano-titanium technology generates a lot of negative ions which helps to keep frizz at bay. So once you are done styling your hair, you will be left with astonishingly beautiful curls, beach waves and if you are straightening your hair, the tousled hair-do it helps you achieve would definitely make the onlookers go “wow!”. It offers a temperature range of 270-450 degrees F which is pitch-perfect for wavy or curly haired folks. Thanks to the titanium coating, you will only have to wait for 15-30 seconds to get the plates to 380 degrees F straight out of the box. Once you are done fiddling with the temperature setting, wrap your curls around the barrel. The tighter you wrap, the tighter curls you get. With its 1-inch plates, getting ringlet-tight curls without fatiguing your arms is a breeze. As we all know, curling and straightening irons can get hot, I mean real hot. If you have kids in your house, leaving a hot flat iron unattended can lead to nightmare scenarios. This iron tags along a safety lock function, a feature you will be forever grateful to if you are a busy, working mom. Although you should never leave the device plugged when it’s not in use, just in case you have to, the safety lock system will safeguard your kid against burns if he or she accidentally touches the device when it is plugged. Another great feature I look for in every hair straightener is the automatic shut-off function. In this case, if the equipment remains unused for 90 minutes, it will automatically turn itself off. Can handle medium-length thick hair exceptionally well. Safety lock and auto shut-off features. Reaches desired temperature under 30 seconds. Not suitable for long, thin hair. You will be glad to know that KIPOZI has a 1.75 inches wide plate option for women with long, untamable, frizzy hair. The rest of the features in both models are more or less the same. To conclude, I would say if safety and saving time are at the top of your bucket list, this 1” models ticks all the boxes. When the aim is to shoo away the frizz and tame those long, tight curls and turn them into gorgeous loose curls, the Remington S9500PP model does the trick. The ceramic plate with crushed pearls gives you a smooth finish and make sure you say goodbye to your frizzy end once the grooming is complete. The USP of this model has to be the flawless incorporation of anti-static technology on the 1-inch floating plates. Before I overwhelm you with more details, I want you to take a quick look at its key features. Heat up time is just under 30 seconds. Floating plates with crushed pearls. Max temp of 450 degrees F.
The Remington S9500PP has a lot of intriguing and hi-tech features rolled into it. Among which, the feature that stands out the most is the anti-static technology. Coupled with pearl-infused ceramic plates, it allows smooth, lag-free passes and leaves your hair with a shiny and voluminous appearance. The anti-static technology is pretty standard in hair styling products designed to fight frizz. I won’t bore you with the technical nitty-gritty. In a nutshell, this anti-static formula reduces the build-up of static electricity, that way, making your hair silky and frizz-free. Why else would German Make-up Championship winner Alexandra Lederer always makes it a point to keep this device handy whenever she’s up to treating borderline damaged, coarse, unmanageable hair? The 1-inch pearl infused ceramic plate is the second most ravishing thing about this brilliantly designed flat iron. It helps the plate glide over your tresses smoothly, preventing your strands from getting snagged. It also helps with the even distribution of heat across the plate, thus eliminating hotspots. Consistent heating at high temperature ensures that your hair has all the essential moisture locked in it. Talking about temperature, the plate can get as hot as 450 degrees in 0 seconds which is crazy! While this is not a good news for people with thin, sensitive hair, girls blessed with coarse, super thick hair will benefit greatly from it. Just split your hair into a few sections, one pass on each section (maybe twice) and you will ready to set the stage on fire! Not literally though. Talking about fire, to make sure that your flat iron doesn’t set your house on fire instead of the stage, it has a 60-minutes auto shut-off feature. There’s also a Temperature Lock system that lets you temporarily lock the device while keeping your desired temperature intact on the plate. This is going to help you speed up the styling process during the busiest hours of the day. It also consists of a swivel cord to ensure you don’t end up with dead arms in the quest of styling your hair to perfection. I know I’m witty, thanks! Max temp of 450 degrees is apt for treating frizzy, tight curls. The anti-static formula provides a smooth and silky finish. Swivel cord makes it easy to maneuver. LCD readout let you constantly keep tabs on the operating temperature. Auto shut-off and temperature lock system. Not the best option for dyed hair. The on/off button is a bit too small. Salon-grade styling of coarse, thick hair at the comfort of your house has been made possible by this device. From pearl infused ceramic plate, anti-static technology to user-friendly operation and safety, this device ticks all the boxes. If you want to nourish damaged hair while styling it without drilling a crater in your wallet, this product is worth a look. Infiniti Pro Ceramic Flat Iron is a cheap hair straightener that delivers all the hair styling powers into your hands. With this innovative and versatile hair flat iron, you can now enjoy professional capabilities in the comfort of your home. This Ceramic Flat Iron is designed to protect, revitalize, and nourish your hair when straightening and styling. It has an ergonomic design with an easier grip, which makes it easy for the user to hold. Infiniti Pro features the Tourmaline Ceramic technology emits negatively charged ions during styling. As a result, this ceramic hair straightener diminishes flyaways and frizzies for healthy-looking, glossy hair. It comes with Argan Leave-in hair treatment that helps smooth out and protect tresses while nourishing and revitalizing your hair. Infiniti Pro Ceramic Flat Iron heats up very quickly, which allows you to style your hair perfectly within a very short time. Besides, the fact that it reaches maximum temperatures of 455 degrees Fahrenheit gives you a quick and efficient styling. 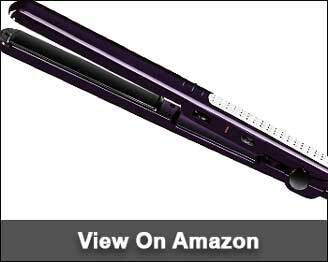 This flat iron has a swivel cord with a free-ranging motion, which allows you to style and curl your hair at any angle. 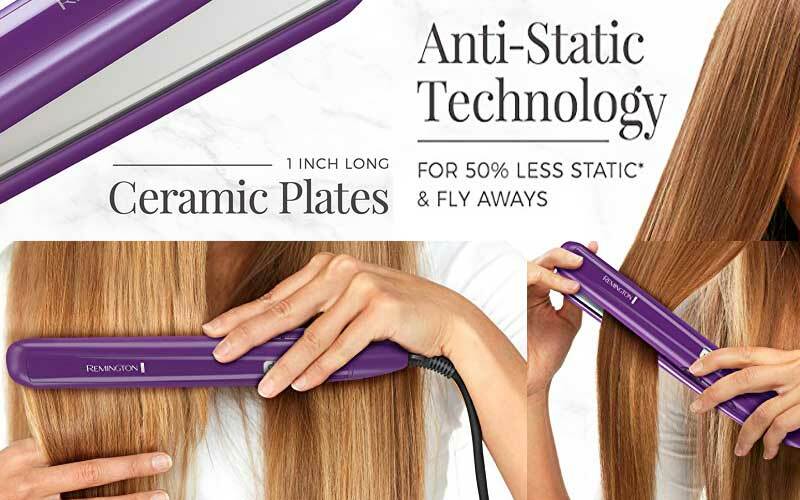 The flat iron has 29 percent longer plates with three times smoother surface that delivers a faster glide compared to other drugstore flat irons. 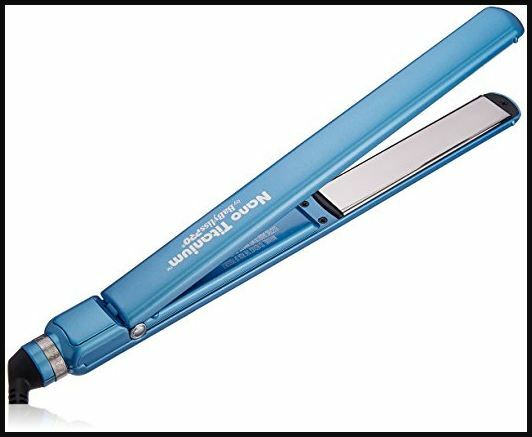 If you have dry and fuzzy hair, then this Infiniti Pro Ceramic Flat Iron is the solution. 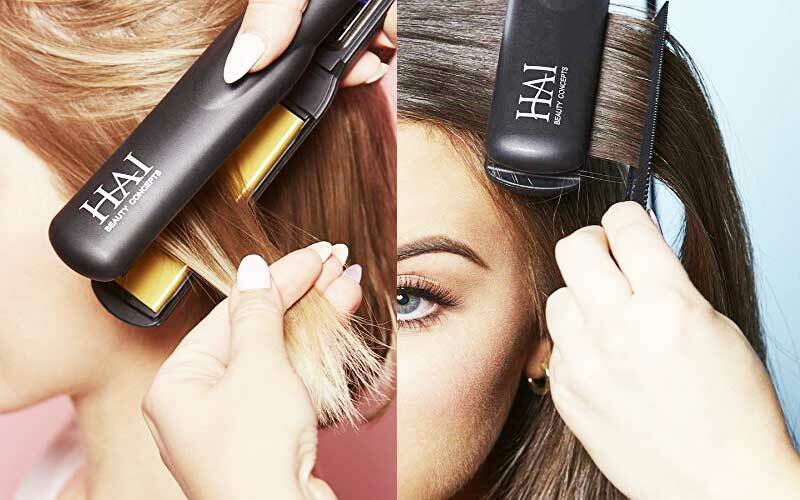 This flat iron works perfectly, even on the fussiest hair. It is designed to take on all heavy-duty jobs, and it straightens out the most frustrating hair. Not only does the Infiniti Pro straighten out hair, but is also revitalizes and nourishes it by providing maximum conditioning during the straightening process. The iron reaches heat high enough to handle hair that is out of control, delivering shiny and soft hair without any damaging hot spots. It is a versatile flat iron that can be used even on the toughest hair. Has a wide plate, which makes it easy to style the hair of any length. The flat iron comes with leave-in oil that leaves the hair smelling great. Does not tug or snag on hair. Works great on the hair of all types. Comes with handy accessories like hair oil, a heat glove, and a travel bag. Some customers complained that the plates do not evenly meet, which means that you have to apply pressure for an even straightening. 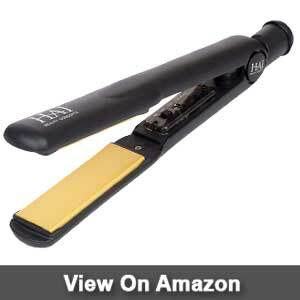 From the several CHI flat iron reviews, we gathered that this is a popular brand. Chi Original Ceramic Tourmaline Straightener has a 4-in-one application, where you can wave, flip, curl, and straighten the hair. Chi is a to-go brand when it comes to hair styling and maintenance tool, offering endless possibilities as far as hair care is concerned. This professional tool delivers salon-quality result in no time. CHI Ceramic Hair Straightening Iron has extra-long plates available in one inch, one and a half inches, and two inches. These plates greatly reduce the straightening time. These plates are extra-long which makes it easy to reach the roots, even for long hair. The plates are great at heat conduction and are resistant to corrosion which consistently maintains high temperatures while releasing negative ions. As a result, you will enjoy faster straightening without your hair drying out. CHI Ceramic Hair Straightening Iron has a sleek and soft metallic Ryton housing which can withstand very high temperatures. Besides, the iron’s housing is well-balanced and ergonomically designed to ensure maximum comfort while styling. The ceramic tourmaline plates are extra smooth, and they easily glide through hair without tugging. This versatile flat iron beautifully straightens, curls, or flips hair, depending on your preference. Also, the flat iron features versatile heat settings, which allows you to achieve your desired hairstyle easily. 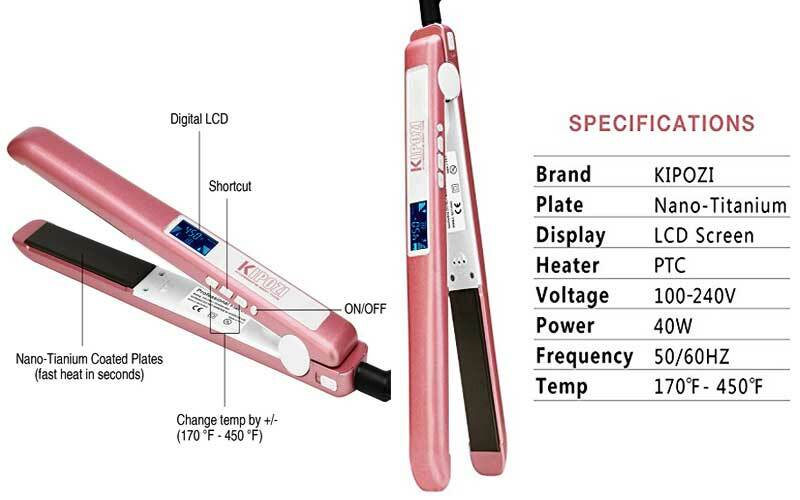 Chi Original Ceramic Tourmaline Straightener has an advanced infrared heat technology and solid ceramic coils and plates, which makes it possible to maintain an even temperature. With this technology, it is easy to reduce static charges and hair frizzing. You can, therefore, easily enjoy an even, glossy throughout the entire hair length. 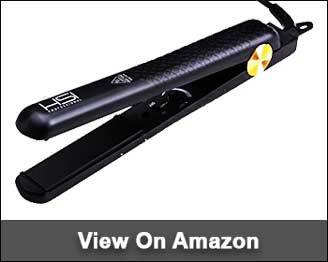 This Iron uses infrared heating, which works excellently even on very thick and curly hair. The iron is thin for easy traveling. The plates are long, and they can hold wider sections of hair at once. This iron is lightweight, thus easy to use. You will achieve perfect results in a matter of minutes. The power switch is on the handle of the iron. Some customers complained that the bottom of the flat iron is slightly loose. Philips HP8302 is the ideal styling tool for straight and shiny hair which requires a 110v-240v power supply. With its instant heating ceramic plates, a light indicator, and 1.8 meters, tangle-free cord, this hair straightener have all the ideal straightening features to be regarded as the top-rated flat iron for black hair. It works perfectly on the hair of all lengths and thickness, and the result is straight hair. Philips HP8302 is not any conventional straightener; it delivers exceptional performance, giving you shiny and polished straight hair without causing any damages. Now a great way to enjoy instant and exceptional styling. It features a 360-degree swivel cord which rotates to eliminate any tangling of the wires. Besides, the cord is 1.8 meters long, which allows the free movement of the user. It is, therefore, very convenient to use this flat iron. Philips HP8302 hair straightener heats up very fast in just 60 seconds, giving you that perfect styling instantly. With its Ceramic technology, the heating plates of Philips HP8302 has a ceramic coating, which retains and distributed heat evenly. You will, therefore, achieve fast and efficient results. Besides, Philips HP8302 has an indicator light which lights up when the hair straightener is turned ON. This Philip hair straightener has a dual-voltage for use worldwide, and it is hence ideal for traveling. 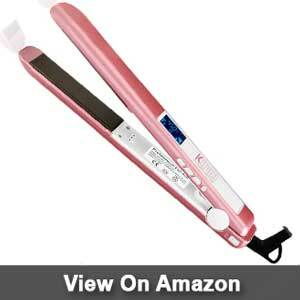 Also, the hair straightener has an ergonomically-designed body for maximum comfort and ease of use. We loved the simple and intuitive operation of this hair iron; you simply push the easy-slide control button. Also, the ceramic plates glide smoothly and effortlessly through hair, delivering sleek result without any damages. The hair straightener also features an easy, secure lock for safe and convenient storage. A key feature of Philips HP8302 that stood out for us is its high-temperature capacity. 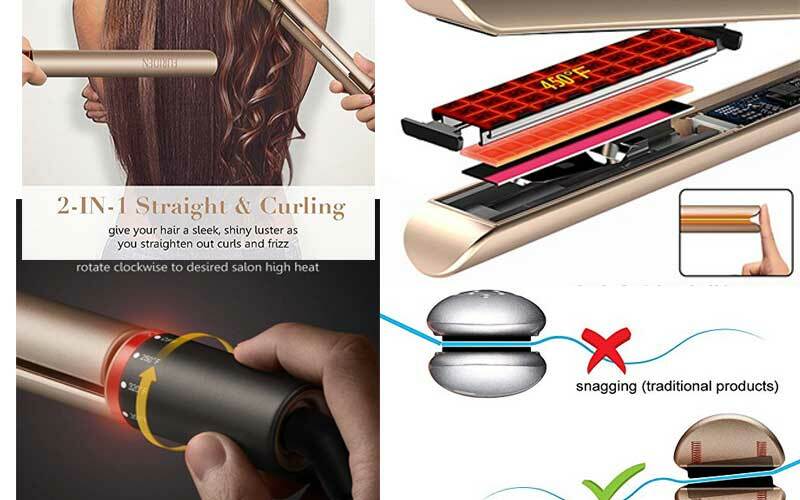 This hair straightener can accommodate temperatures of up to 210 degrees Celsius. With this high temperature, it is easy to style your hair, giving you that perfect, salon-like look. Philips HP8302 scored poorly on our review of the best affordable flat irons for 2018. This flat iron has no heating indicators. As a result, you will have to assume the amount of heat that is perfect for your hair type. This hair straightener works perfectly on the hair of all types. Works very fast and efficiently. Has a ceramic plate which adds some gloss to your hair. It is handy and very light. The flat iron has a fairly long wire of very high quality. It is a budget product that provides value for your money. Has an excellent build quality. It has no heating indicators. FemJolie hair straightener was our favorite hairbrush. One thing we like about FemJolie is that it has both rotating and multi-directional movement. Besides, you can use the brush without a spin action. Also, the brush delivers instant salon-quality results, with which you can say goodbye to bad hair days. FemJolie has an exclusive and innovative technology, which makes it anti-static and anti-frizz. Besides, it has a versatile 3-in-1 usage, perfect for everyday use. We loved the features that FemJolie has to offer, and it was our favorite hair straightener in this review. If you have long, thin hair or normal, slightly wavy hair, the size of the plate you should choose will depend on how you intend to use your flat iron. If saving time is your top-priority, then blindly go for a 1” ceramic or tourmaline plate. However, smaller plates will offer more flexibility and options in terms of styling. You will also have to keep in mind that super high temperature and fine hair are not good friends. If you are dealing with fine, damaged and frizz-prone hair, look for a model that allows you to set the temperature as low as 170 degrees or lower. Question: 1. Ceramic plate, Tourmaline or Titanium plates- which one is the best for straight hair? Answer: Ceramic and tourmaline. Avoid titanium plate for pin straight, heat sensitive hair as it can get too hot. Question: 2. What temperature of flat iron is suitable for fine hair? Answer: If you are up for buying a flat iron for fine, straight hair, make sure the lowest temperature setting is at least below 300 degrees. For normal straight hair, temp range between 350 degrees to 380 degrees is considered safe. Question: 3. What hair product should I use to keep my straight hair straightened for a long time? Answer: Sparingly use Argan oil before styling your hair. This will also help you fight frizz for a long time. Question: 4. How long will the straightening look last? Answer: Strictly depends on you straight or wavy your hair is and the kind of flat iron you are using. For slightly wavy to bone straight hair, the effect should last for 3-4 days. If your hair is extremely wavy, it will last for about 1-2 days. Question: 5. Do I need to use hair protection spray before ironing? Answer: You definitely should if you have sensitive hair. The right plate size for thick, coarse and curly hair will depend on the hair length. For short hair, I suggest go with a 1-inch titanium or tourmaline plate. For shoulder length to long hair, plate size in the range of 1.75 inch-inch or higher should work out just fine. Another thing to take into consideration is the temperature. Your flat iron should be able to reach at least 310 degrees under a minute and get as hot as 450 degrees to effectively stylize coarse hair. Anything less than 310 degrees will lead to excess energy consumption and increased styling time. Question: 1. What temperature range is safe for ringlet curls? Answer: 350-410 degrees. You can adjust it slightly up or down depending on the tightness of your curls. Question: 2. Which hair straightener plate material is best for curly hair? Answer: Titanium and ceramic plates with scratch-resistant titanium coating. Tourmaline plates with microsensors also work great. Question: 3. Is it possible to get wavy beach style hair with flat irons? Question: 4. What type of flat iron is best for African-American Hair? Answer: Look for a straightener with wide plates (1.75 inches or thicker) and it should provide a max temperature of 450 degrees F.
Flat Irons are for straightening hair. However, you can achieve a wavy or curly effect depending on the type of flat iron and how you use it. This great hair tool is the best way to tame unruly hair, and it can give you a completely switched look in just a matter of minutes. 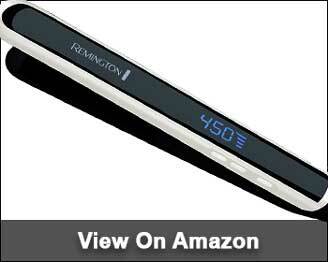 Remington – Remington hair straighteners are fairly priced. They deliver rapid heating times and multiple temperature settings. These models have ceramic, titanium, and even tourmaline plates. BaByliss – This model specializes on hair straighteners that work gently on hair. These hair straighteners are the best for newbies to flat irons. 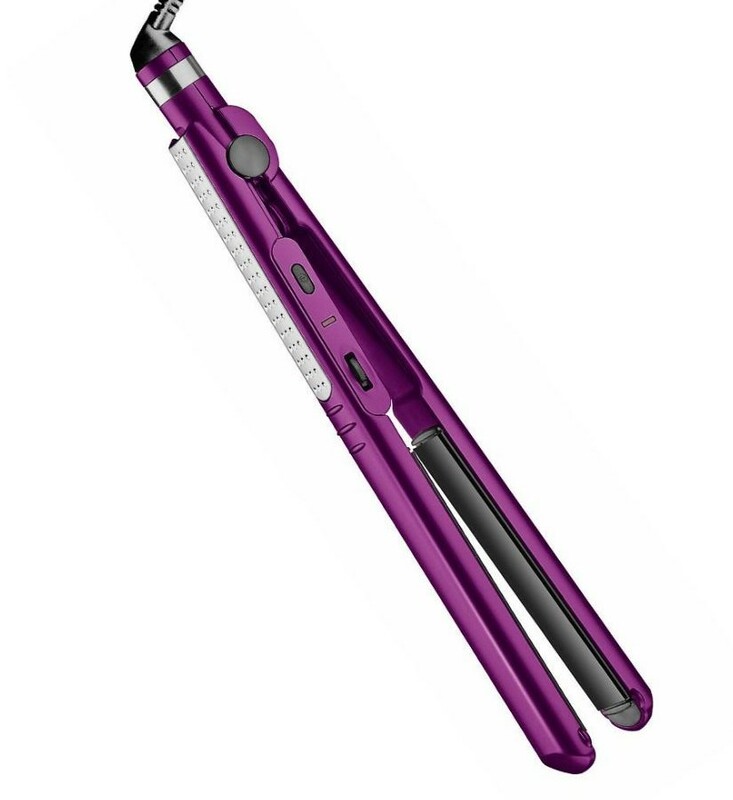 Infiniti – This brand delivers flat irons of multiple designs, sizes, and colors from which you can choose. Sedu – This model is famed for making high-quality flat irons. You will never find a cheap Sedu unit. In our selection for the top quality flat iron, there are several factors that we considered. Our top picks have multiple temperature settings, which allow for use on hair of all types. Also, our favorite flat irons come with a range of accessories and tools for a hygienic, safe, and easy styling. These tools include holders, carrying bags, cleaning tools, replacement plates, among others. We also checked with the ease of use of the flat iron. Our top picks have auto-off features, temperature controls, and digital readouts. The material of the flat iron plate is ultimately the most important aspect for any hair straightener. The plates generate heat which, upon application of pressure, forces the hair to conform to the plate shape temporarily. You can, therefore, achieve a curly or straight result depending on the motion in which you use the plate. 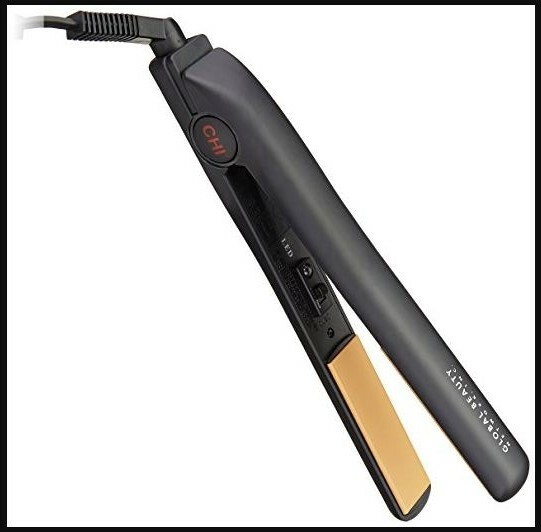 Ceramic Irons – These are the oldest plates, and they are popular because of their fast heating time and even heat distribution. However, beware of ceramic coated irons as the coating may wear out with time. Tourmaline Irons – This material produces more negative ions than the ceramic material. The negative ions effective balance out the positive ions released by dry hair, and they result in frizz-free hair. Titanium Irons – Of the three categories, Titanium irons have the fastest heat transfer. Therefore, they deliver instant results. For thick, curly, wavy, or full-bodied hair, any of the three plate materials will work perfectly. However, individuals with thin, straight, or fine hair should avoid Titanium irons because they reach very high temperatures, and could easily damage your hair. Plate sizes are either narrow or wide. Narrow plates are perfect for an in-depth styling like crimping and curling. They also work best for short to medium-length hair. Wide plates, on the other hand, are best for longer hair. 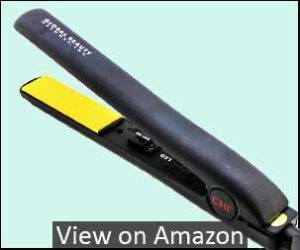 The technology of flat irons is on the rise, and almost every straightener advertisement use silver, Nano, infrared, or wet-to-dry. Silver – Silver plates eliminate the buildup of germs and other unsanitary microbes on your hair straightener. It is, therefore a great option for health-conscious customers. Infrared – These irons heat hair gradually thus delivering faster results while protecting hair from damage. Nano – These plates are created using microscopic particles which generate more negative ions for a frizz-free styling. Wet to dry – This new technology works well for both dry and damp hair for exceptional results. Do the straightening irons damage hair? Yes. Because hair straighteners use heat, they weaken the hair cuticles after every use. However, the extent of damage depends on your hair type and how you use the flat iron. Take caution not to overdo your use of the iron. Also, use heat protection products like oil or spray as much as possible to keep your hair hydrated. What is the optimum temperature of a hair straightener? The optimum temperature depends on the thickness and structure of your hair and the type of styling that you need. However, this temperature is approximately 365 degrees Fahrenheit. Flat irons deliver versatility in the hair styling options. Having a flat iron saves you the energy, time, and money of having to visit a salon. Flat irons deliver quick results. It is safe to use a flat iron on colored hair, unlike permanent straightening. Flat irons are gentle on your hair, and they do not cause thinning or breaking. The best flat iron is one of the most meaningful investments that you will ever make on yourself and your confidence. With an excellently performing flat iron, you will achieve the hairstyle you desire in just a matter of minutes. Use the flat iron, or airbrush, whenever you are leaving the house for beautiful and glossy hair all day long. All the above reviewed flat irons are great, and they all come at an affordable price range. It is now easy for you to identify the best flat iron for you.